Relumins Pro Acne Care formulas contain FDA approved acne fighting ingredients that is clinically proven to be stronger and more effective than Proactiv. Relumins Professional Acne Clear Foaming Wash - Designed to helps reduce the appearance of acne and prevent future breakouts with Salicylic Acid, naturally derived from Willow Bark. The Soybean Seed Extract promotes collagen biosynthesis and inhibits pigmentation. The Pear Ferment peels and clarifies clogged pores. Easy applicator generates a foaming face wash that deeply cleanses to remove make-up, dirt and oil from pores. Relumins Professional Acne Clear Serum - Designed to penetrate active blemishes to reduce the appearance of acne causing bacteria to reveal healthy, glowing, clear skin. Neem Leaf Extract prevents aggravation of acne due to mental stress and helps fight against damaging inflammation. Relumins Advance White Stem Cell Therapy Intensive Repair Serum - Designed to hydrate skin and help you achieve a healthy even glow. The first whitening and hydrating serum to combine Placental Protein and TA Stem Cell. The active ingredients have exfoliating, whitening and anti-aging benefits. Relumins Advance White Glycolic Peeling Gel - With 5% Glycolic Acid, this gel is gentle yet effective. It helps rid dead skin cell build-up with an effective exfoliant ingredient and with a unique blend of natural fruit extracts and Glycolic acid that makes the skin firmer. Relumins Advance Titanium Derm Roller 540 - Improves the thickness of the dermis as well as the epidermis. This in return improves skin texture and reduces the appearance of wrinkles. It also has a positive effect on hyper-pigmentation as well as on hypo-pigmentation. Improves blood supply and harmonizes pigmentation. 1. Use Relumins Acne Clear Foam Facial Wash to cleanse morning & night. Pump into your hands and work into lather. 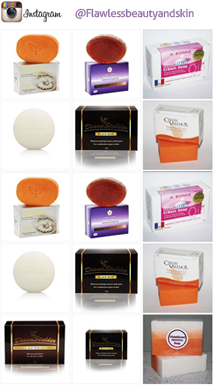 Massage lather onto skin with a gentle, circular motion, avoiding contact with the delicate eye area. Rinse and pat dry with a soft towel. 2. Apply Relumins Acne Clear Solution directly on face morning & night, moving outward up and under chin and neck. 3. 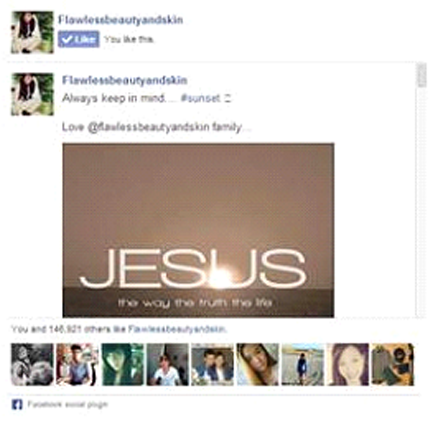 Apply Relumins Acne Clear Serum on active blemishes at night. 1. 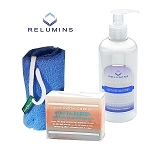 Continue using Relumins Acne Clear Foam & Solution in the morning/evening. 2. Apply Relumins TA Stem Cell Serum on dark spots. 1. Apply gel to treatment area and gently massage for two minutes, gradually increasing treatment times with subsequent applications. Rinse with soap and pat dry. Apply toner and cream. Repeat up to 3 times a week. Apply more generously to areas that are harder to lighten. 2. Once a week using the roller with slight pressure; roll the device back and forth four times in four directions. The treatment should not be painful and should not draw blood. You will become accustomed to how much pressure you can apply without causing any discomfort. 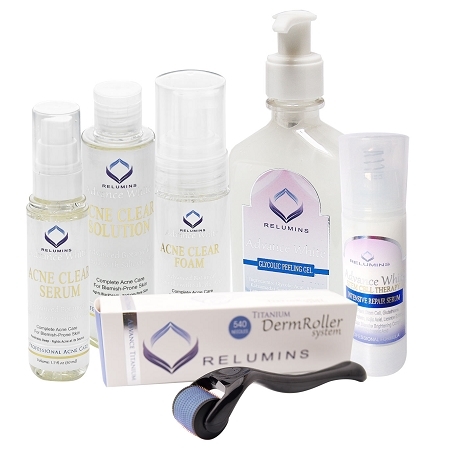 Clinical studies have shown that over 94% of patients using the DermaRoller/MicroNeedling Treatment System achieved a reduction in the severity of their scarring by one or two grades. More than More than 80% of patients assessed their treatment as â€˜excellentâ€™ on a 10-point scale.